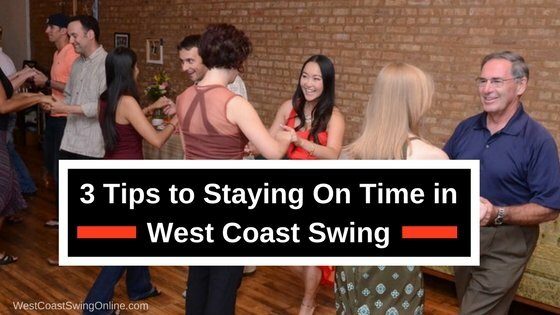 The #1 struggle we hear from new west coast swing dancers is that they struggle to stay on time. While they might be ok when dancing just the basics, things tend to fall apart as they dance more complex moves. If you struggle to dance and keep the count going at the same time this article is for you! Some people learn to dance without spending a lot of time counting music, and they tend to dance by feel. No matter who you are, or how skilled you are at feeling the music, counting always elevates your dance. Counting gives a way for both partners to be simultaneously directed to the same thing. Even if you are great at feeling the music, you will always be more precise if you are also focusing on the count. When your counting is rock solid, you’ll be able to deviate from the beat and reattach seamlessly. How do you improve your counting? First, spend some time listening to WCS music and counting throughout the song. (I do it in the car) As that becomes more comfortable, progress to dancing your basic patterns by yourself with no partner. (a partner will complicate things at this point) Finally, give it a try while out while social dancing or while practicing with a partner. Focus on counting through the entire song. No matter how you count, the key is to keep the count running through your head for the entire song. If you are a dancer who moves by feel, this may take a while to become comfortable with counting and dancing. That’s ok: you are reprogramming the way you listen to music so that you can perform at a much higher level, and that’s going to take some time. One of the tips I use is to ‘sing the counts’ in my head which creates a more solid connection from the counts to the music. Because west coast swing is a two beat dance, recognizing the difference between downbeats and upbeats is an essential skill. As patterns become more complex and as the dancers introduce more play in the middle of patterns, you need to immediately know which beat is which in order to stay on the correct timing. The purpose of this exercise is to train yourself to instantly recognize whether you are on a downbeat or upbeat. To get to the point of instinctive recognition, you need to practice well beyond the point of conscious understanding. This drill will feel simplistic after a short while, and that’s okay. It’s much easier to keep the rhythm of downbeats and upbeats in your head when you have no other distractions. Your goal is to practice to the point where you can’t lose track even if you are distracted. Once you have this exercise mastered, practice by skipping your music player to the middle of the song and see how quickly you can correctly identify which beats are the downbeats and which are the upbeats. Or, carry on a conversation with a friend while music is playing in the background, and re-identify which beats are which throughout the conversation. This part of the exercise trains you to make the identification quickly when you haven’t been following the music closely, which is similar to what will happen in the wild when you lose the beat of the song and need to quickly reset your internal metronome. How do you make use of west coast’s two-beat foundation? For starters, every movement belongs to a downbeat-upbeat pair. If you are having problems with a move, break it down into each downbeat-upbeat pair to see where the problem lies. Want to take your musicality to the next level? Click the image below and get our our #1 key to WCS musicality. Its a great video that really unlocks the big step to higher level connection with the music in WCS. Enjoy! Which video are you referring to in tip #2? There’s no video linked in line “TAKE ACTION>> Watch a video of this drill” unfortunately. I’m not sure of the exact video that was linked there. VIDEO- 4 keys to better timing.